All of a sudden, $1 trillion in gross merchandise sales in 2020 is beginning to seem possible. Alibaba (BABA - Get Report) Chief Financial Officer Maggie Wu got a round of applause from the crowd at the company's annual investor day in Hangzhou, China on Thursday after forecasting 2018 revenue growth up to 12 percentage points higher than analysts were expecting. "The mood at the Investor Day was jubilant," Maybank Kim Eng head of Asia Internet and telecom equity research Mitchell Kim said. At the first day of the two-day meeting, the dominant Chinese online retailer forecast revenue to grow 45% to 49% in 2018, vs. the FactSet consensus estimate of 37%. "Despite having a larger [business] base, we continue to accelerate our revenue growth," Wu said, in reference to the company expanding into different verticals, such as cloud computing and digital media and entertainment. The stock skyrocketed Thursday, closing up about 13% to $142.34. Year to date, the stock is up more than 60%, vs. the S&P 500's increase of about 9%. 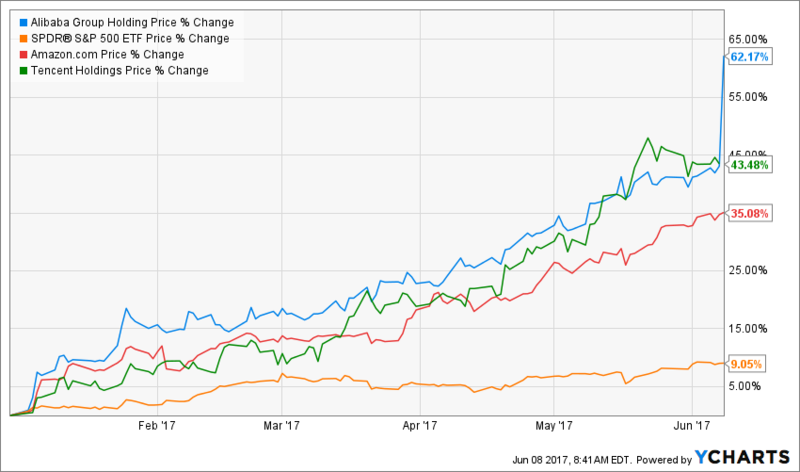 Meanwhile Chinese competitor Tencent (TCTZF is up 44% in 2017 and U.S. competitor Amazon (AMZN - Get Report) is up 35% this year. Kim said that Alibaba is the firm's top pick in the Chinese e-commerce space and that he expects the presentations from the two-day event to add more bullish sentiment to the stock. Morningstar CFA R.J. Hottovy said the big news is clearly the surprise revenue guidance. "This implies accelerating organic revenue year-over-year (after adjusting for Youku and Lazada), which is impressive at this point in Alibaba's history and underscores all the various ways they can monetize their data," he said. Updated from 9:46 a.m. with additional analyst comments. In the past year ended March 31, the company absorbed video site Youku and Southeast Asian e-commerce platform Lazada, which helped spur the 56% revenue growth for the year to $23.3 billion, which it reported in May. After adjusting for the two business consolidations, revenue growth would have been about 44% to 45%. At last year's investor event, Alibaba had originally forecast revenue growth for this past year to grow 28% and later revised it up to 53%. Sellers flock to Alibaba because they can get detailed information on what customers want and what marketing campaigns are working, Kim said. For example, 50% of Taobao users check out an item after seeing it demonstrated on a streamed video. "This is why analytics are so important for BABA and the platform continues to become more powerful," he said, nothing that Alibaba has than 500 million users across its TaoBao, Alipay and Cainiao divisions. Kim said he was surprised by the strong revenue guidance since the company won't be benefiting from the increased ad load that gave the company a boost in the for half of the last fiscal year. Alibaba will need to rely on click volume increase instead, which means it needs to increase engagement and monetization. As an example, the company said the average TaoBao app user opens the app eight times per day and it expects that figure to increase. The other big takeaway from the first day of the company's two-day event is that Alibaba's ambitious target for its 2020 gross merchandise value, or the total value of merchandise sold over a period of time, is beginning to look more plausible as the company integrates Lazada and continues to expand outside of China, Hottovy said. At the event, Alibaba CEO Daniel Zhang reiterated Alibaba's $1 trillion GMV target for 2020. This past year, GMV came in at $547 billion, up 18% from the year prior when it came in at $463 billion. To reach $1 trillion in the next three years, GMV will need to increase 82.8% from this year's figure. Kim noted that Alibaba's revenue isn't as dependent on transactional GMV as other players in the space. "Alibaba is one of those rare companies where growth is re-accelerating against decelerating macro growth," he said. At the second and final day of the event on Friday, Alibaba founder and executive chairman Jack Ma and executive vice chairman Joe Tsai will speak. The event begins at 3:45 a.m. ET. You can watch the live webcast or a replay of the webcast by following this link. Alibaba's stocks had risen 12% to $141.13 on Thursday afternoon.